The idea that jazz has to renew itself sometimes results in rather pretentious and purely intellectual experiments with form, but it is possible to play inventive and intellectually stimulating music without losing a sense of fun and inclusive curiosity. Saxophonist Chris Cheek is the proof. Cheek comes with a refreshingly unprejudiced approach to music and this is evident on his long-awaited follow- up to his previous album as a leader, Blues Cruise, (Fresh Sound New Talent, 2006). Make no mistake, Cheek knows how to create and play complex compositions and his collaboration with bassist Stephane Furic Leibovici on Jugendstil (2008) and Jugendstil II (2010) underlined that he knows the cool language of the avant-garde by heart. However, he is not afraid of flirting with pop and rock and Saturday Songs sees him adding country to his vocabulary. Vibraphonist Gary Burton already experimented with country on albums such as Tennessee Firebird (1966) and Country Roads and Other Places (1969), but in spite of guitarist Bill Frisell and other musicians that have attempted to integrate it into jazz, country is hardly a genre that has become completely comme il faut. It is a typically Cheeky move to bring it into jazz. Refreshingly, he does so without a trace of postmodern irony. Instead, David Soler's weeping steel guitar adds both swing and atmosphere to pieces like the opener, "String Finger," and the ballad "Either Way," with wonderful bossa nova- drumming from Jorge Rossy and tasty accompaniment from bassist Jaume Llombard. Soler is not the only guitarist. 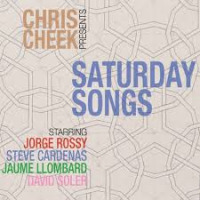 His interplay with guitarist Steve Cardenas is a joy to behold and like Soler, Cardenas knows how to swing and rock in a modern style, as proved by the funky, indie-influenced "Alhambros." Cheek himself is in the middle of it all. He is both playful and can interpret a ballad in a sensual and soft way that would likely be approved by Stan Getz. In fact, Cheek seems to be able to move in all possible musical directions, but the nice thing is that he does not try to prove himself. Instead, he lets the music unfold naturally. Scholarly listeners could find much to dissect in the music that uses advanced composition techniques and inspiration from such widely different sources as French composer Olivier Messiaen, and wild man drummer, Ginger Baker, but Saturday Songs works on all levels and this is perhaps its greatest achievement. The record is complex and still melodically straight and enticing. It is music to be listened to at a barbecue, in a car or alone in your room. The album rewards deep listening, but could also be played as an introduction to someone who has not listened to jazz or as the perfect way to relax on a Saturday or any other day of the week with a great bunch of unconventional jazz songs. Cheek has previously played a composition called "Artlessness." This is artless art-music. Track Listing: String Finger; Ginger Something; Eye Factory; Buckey's Blues; Either Way; Slow Ship; Saturday Song; Alhambros; Forever Green; Strawberry Jam; While You Slept; Windmill Hill . 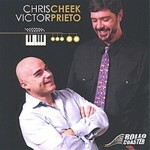 Personnel: Chris Cheek: tenor saxophone; Steve Cardenas: guitar; David Soler: pedal steel; Jaume Llombard: bass; Jorge Rossy: drums, vibes, marimba.